In case you didn’t notice, you, my dear readers, get recipes instead of writing articles on the days when my son had a bad night. And yes, last night was a BAD night. He went to bed at his normal time, slept forty minutes, then woke up and cried until 1 a.m., which was when I gave in and gave him some baby Motrin for his teeth. It helped a little, at least until 5 a.m. *sigh* So here’s a quick, easy, family-pleasing recipe for you! Enjoy! Sauté the onion, beans, and chilies in a little butter. Then spray a non-stick skillet with cooking spray. Place one tortilla in the bottom, THEN turn the heat on to medium. 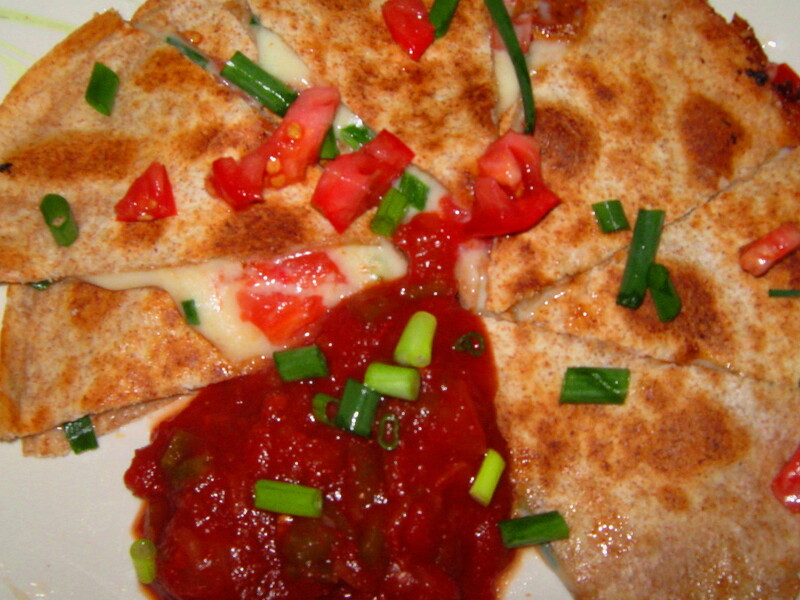 Cover the tortilla with a generous amount of cheddar cheese, then sprinkle with the bean, onion, and chili mix. DO NOT put on the top tortilla yet. Cover the skillet with a lid and let the cheese melt. When the cheese is nicely melted, then put on the top tortilla, pressing it down so that they stick together. When the bottom is nicely browned and crispy, flip the quesadilla and brown the other side. Slide onto a plate, cut into eight wedges with a pizza cutter, and serve with salsa. *Other filling ideas: green onions, pre-cooked chicken, colby-jack cheese, green peppers, browned ground beef, tomato, bacon (basically whatever you want). Me: Our son really liked it. He ate two bowls. Him: I hate lentil soup. Him: Silence, then tastes a small spoonful. Me: Well, how is it? Him: Either I’m really hungry, or this is really good (said grudgingly). I’ll let you be the judge! Here’s my recipe. Pour olive oil in bottom of heavy dutch oven. Sauté onion, garlic, carrots, celery, and bacon over medium heat until softened. 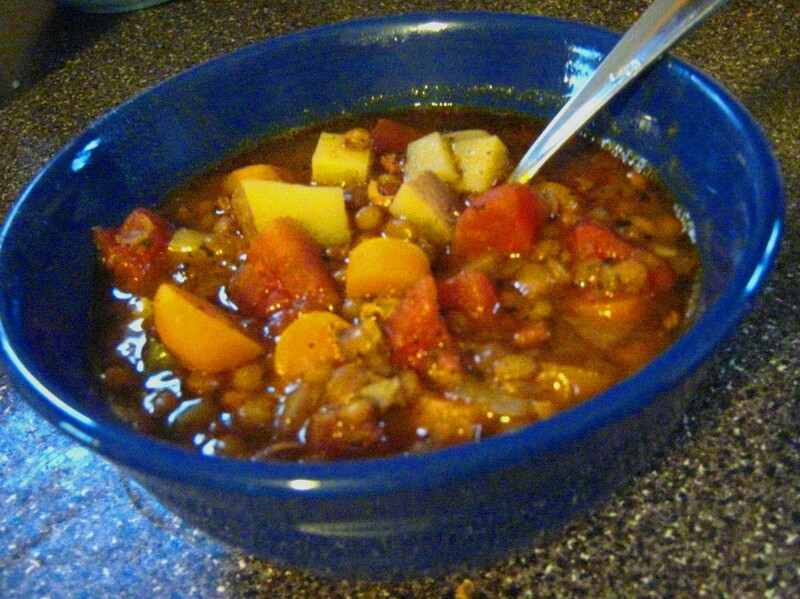 Add water, lentils, potatoes, tomatoes, basil, oregano, and black pepper. Bring to boiling, then lower heat and simmer, covered, about an hour. Taste soup and add salt accordingly. Add balsamic vinegar. Continue to simmer until potatoes are soft, about another 20 minutes. 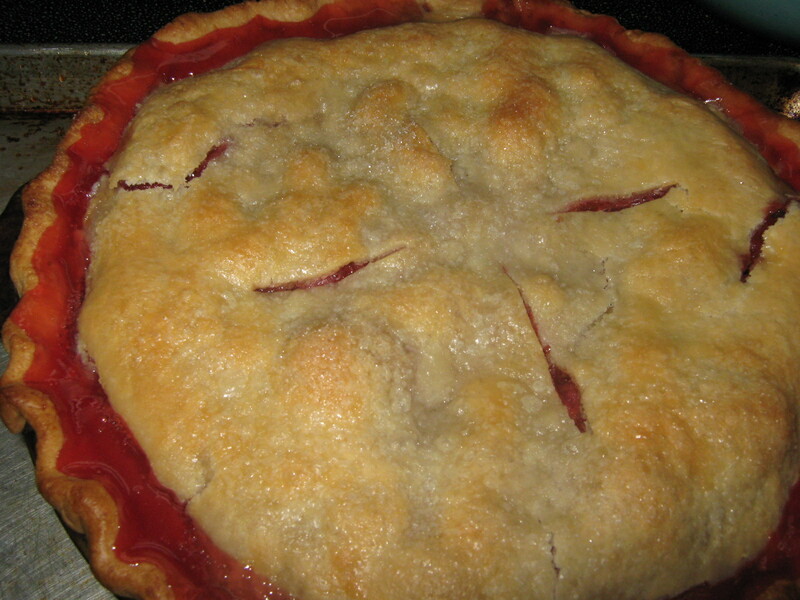 My husband has been begging for a strawberry-rhubarb pie, even to the point where he tried to flatter me into making it by telling me I “make a mean pie.” So here you go! 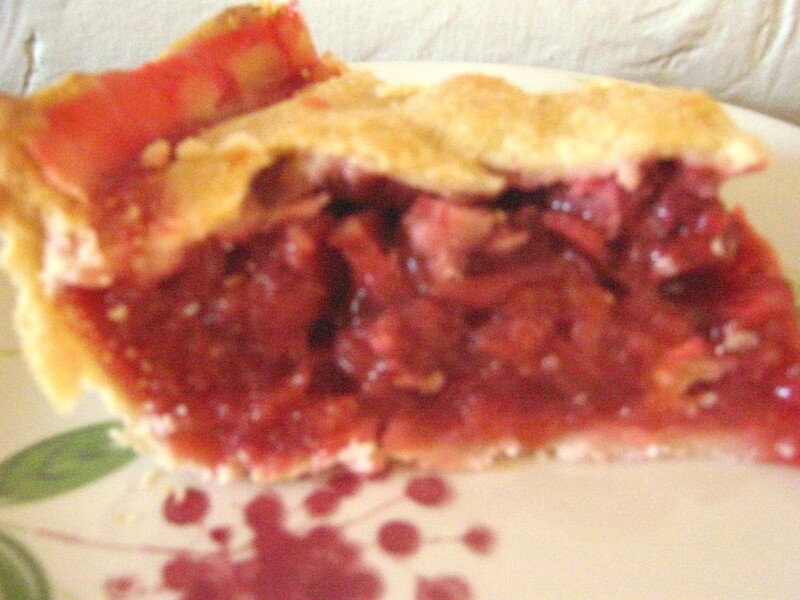 My Dad grew the strawberries, and my mother-in-law grew the rhubarb, so it’s also kind of an “in-law pie.” Neat! Preheat oven to 425 degrees. Have two store-bought or homemade pie crusts ready. In a large bowl, mix together 2 ½ cups rhubarb, 3 cups strawberries, 1 ¼ cup sugar, 1/3 cup cornstarch, and 1/4 tsp. salt. Let sit 15 minutes. Line bottom of pie pan with one crust. Fill with filling. Cut 2 Tbsp. butter into small chunks and dot across the filling. Moisten the edge of the crust with water, then place second crust on top. Pinch edges of crust together, and flute to make a seal. Cut slits for steam to escape. Brush with whole milk and sprinkle generously with sugar. Bake for 30 minutes, then lower the oven temperature to 350 degrees and bake until juice bubbles out of slits. You may want to put a cookie sheet under the pie to catch any spilled juice. If the crust becomes too brown at any point during baking, tent with foil. Let cool completely before slicing. It’s that time of year again! My family and I made roasted pumpkin seeds for a snack today while watching a few SNOWFLAKES fall past the window. They were delicious! (the pumpkin seeds, not the snowflakes!) Here is my recipe. and dump them all onto a clean, dry dish towel and pat dry. Next, liberally spray a shiny baking sheet with butter-flavored cooking spray. Place dried pumpkin seeds on the sheet and spray them with the cooking spray as well. Salt and pepper generously. Bake until golden brown (about 25 minutes). This is the best cookbook ever. If you don’t have it, you have to go buy it! The recipes are delicious and easy to follow. We’ve tried about twenty recipes from it and my husband has loved all of them but two, which is HIGHLY unusual. Last night we made Ree’s Chicken Spaghetti, which the hubby calls “Cowboy Spaghetti” because of Ree’s husband, the Marlboro man. It’s also listed on her blog, if you want to try it. Tonight we’re having her pulled pork recipe from the same cookbook. SO delicious. Heat olive oil in bottom of heavy dutch oven. 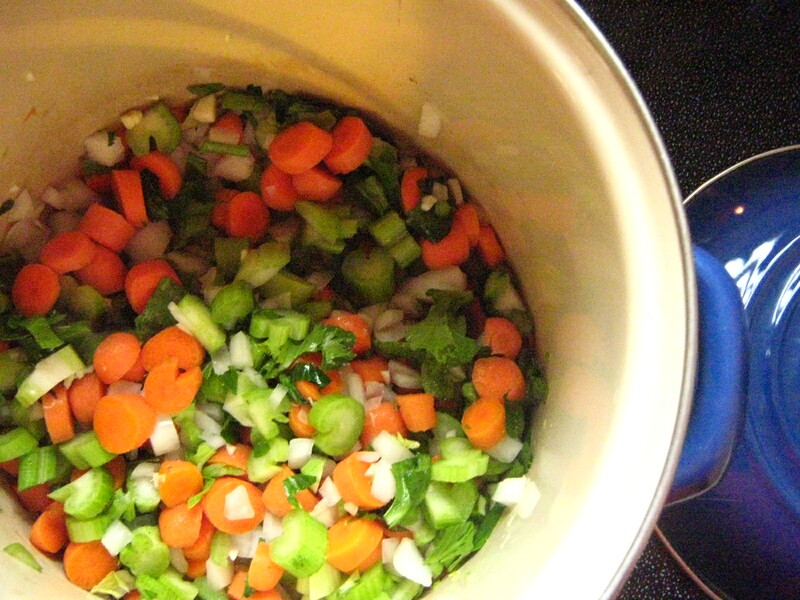 Saute onion, garlic, celery, and carrots until slightly softened. Add water or broth, the tub of stock, the peas, the carrots, the corn, the barley, the thyme leaves, and the bay leaves. Stir, then bring to boiling. Lower heat, cover, and simmer and hour to two hours, until the vegetables and barley are soft. Add salt and pepper to taste. 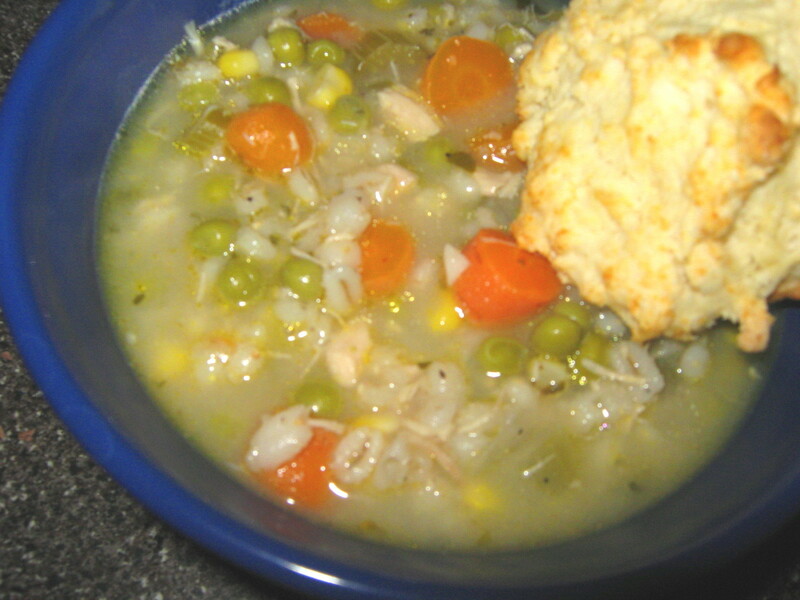 Serve with toast or biscuits. 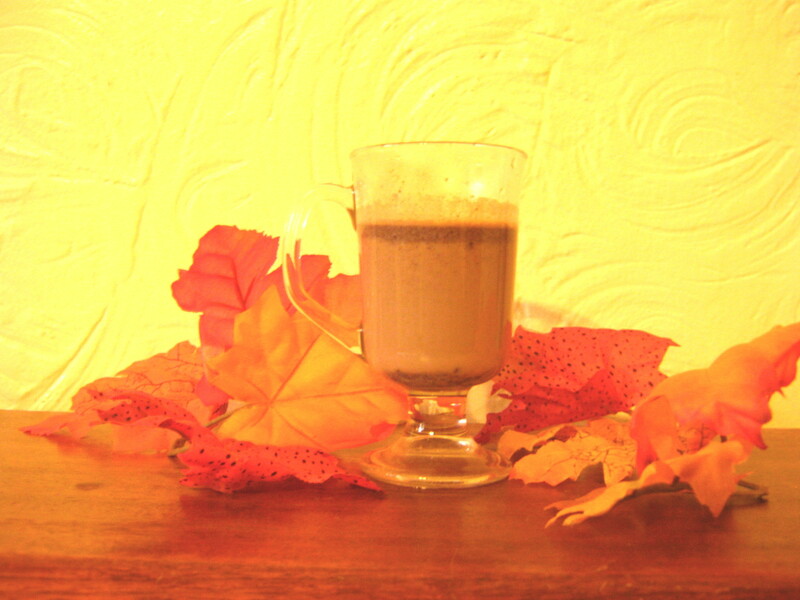 This hot chocolate will take the sting out of any rejection! Put the chocolate, 1/4 of the milk, and the sugar in a saucepan. Heat until melted but don’t let it boil. It will get all chunky if you do. Add the rest of the milk and heat through. Serve in mugs with whipped cream.